In June 2016, Instagram made the somewhat controversial decision to move away from a chronological feed in favour of an algorithm based feed that showed popular content, the same move Facebook had made years earlier. It upset the greater majority of users and baffled content producers as now there was no way of determining where your content would be shown even immediately after posting. Instagram claimed (with a good amount of PR BS) that this new feed was “ordered to show the moments we believe you will care about the most” but the real reason was that 9 months earlier they had released and started testing their new ad platform. This timeline is not at all coincidental, Instagram was in the process of tailoring a feed for ads and this huge move away from chronological order was to help them increase investment in ads. Simply put, a chronological feed means that an ad, when posted, can be pushed down by content posted afterwards, thus reducing visibility to users. Unlike Google search or magazine ads, which remain static, Instagram’s feed changed every few seconds for most users. Instagram saw this and needed to gain some control over ad positioning, so they moved away from chronological and focused on a “popularity” based system. Ostensibly, this would show posts popular within your network but, in the background, this allowed them to introduce bid manipulation of ads to guarantee position. So, hypothetically, a brand pays £1 for its ad to sit in position 5 in user feeds, they get 1000 views. If they pay £5 to put their ad in position 3, they get 20,000 views. This new feed was designed for them to say to a business, “give us X budget and we will give you Y performance” thus enticing brands to invest. It’s a common complaint online (I found the above with 3 searches on Twitter in less than 30 seconds) with users and content producers alike struggling to maintain their following, let alone grow it. Some may attribute it to a “bot cleanse” (clearing out of fake accounts) but this often happens over the space of 24 hours when done in the past and shouldn’t be so long term. So why is it so hard to gain and keep followers on the platform? Well, again this boils down to the new feed and another common complaint people now have about Instagram. Users are complaining about seeing old photos hours, days and sometimes weeks after they were first posted. This fatigues the user’s engagement but, crucially, means the only fresh posts in the feed are ads. As a result, brands saw a huge growth in engagements and views of posts/videos and by mid 2017 70% of all hashtags on Instagram are BRANDED and 65% of top performing posts feature products! This has also lead to the growth in popularity of the follow/unfollow strategy, resulting in follower counts regularly increasing and then decreasing in the space of 24-48 hours. Meanwhile, company accounts with “fresh-looking” content in the form of ads and competitions, see follower counts grow with great success. What we, as bloggers, need to understand is that we are seen as “filler” within the feed to break up ads. We’re not “influencers” by ANY definition other than the one used to flatter our egos and get us to sign up for more branded campaigns. We are, at best, advocates within Instagram. Shop assistants and sales people who use company products and branding to build/maintain a following. We lost this platform back in June last year and, for those crying out for a return to chronological order, I would bet my career that (unless there is a monumental drop in users within a short space of time) it will never return. Plus, with Instagram stories having ads already, it won’t be long until they fall to the new algorithm too. For Instagram? I imagine this will fall into the same category as Facebook where user engagement with branded content fell to its lowest point ever in 2016. “Ad fatigue” will set in and the feed will become a mess of old posts, ads and branded content. For a company with the tag line of “capture and share the world’s moments” this is hugely disappointing but somewhat inevitable when it comes to valuing revenue over your loyal consumers. For blogging? Well…that’s down to us. 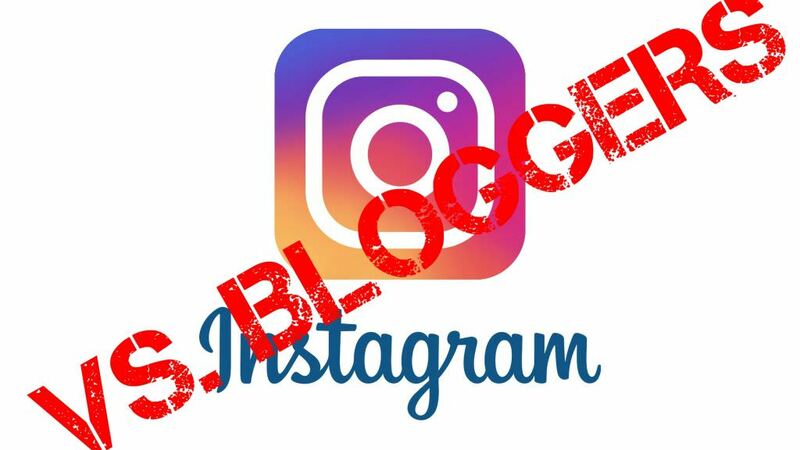 Instagram has forced many of us to use our blog as an extension of Instagram (rather than the other way round) and others have foregone a blog entirely, choosing to be an Instagram-only presence, though weirdly still calling themselves bloggers. If we want to change this we have to make a stand and that means stop taking branded campaigns that require IG posts, use non-branded hashtags and promote organic, user content. Ultimately, the biggest form of protest will be to step away from the platform entirely and give a clear signal to Instagram that we, as a community, reject this business structure of theirs. Or we can continue to go on as normal and see the platform as a full-time career slowly die. It’s up to you. Thank you for checking out the post and make sure to let me know if you have any questions or stories you would like to discuss in the comments section. Don’t forget to follow me on Twitter for updates, conversation and chat on my activities and the blog itself. If you liked this post you may enjoy my Break-up letter to Instagram, so go give it a read!